I’m always trying to come up with the perfect nibble for cocktail parties and gatherings. Through my few catering events, I’ve learned it’s not enough for the food bite-sized. It shouldn’t require any assembly or utensils. It needs to simply be grab-n-go. Savory and sweet on a delicate crisp pastry, these appetizers will satisfy the foodiest of your guests. In a wide-bottomed pan, heat olive oil over medium-high heat until the oil is shimmering. Add onion slices and toss to coat. Spread the onions out as evenly as possible, stirring occasionally. Let cook for 30 minutes to an hour, stirring only when needed. If the onions start to burn or dry out, add some water to the pan. With the goat cheese in a small bowl, slowly stir in the heavy cream until desired consistency is achieved. Arrange mini pastry shells on a baking sheet. 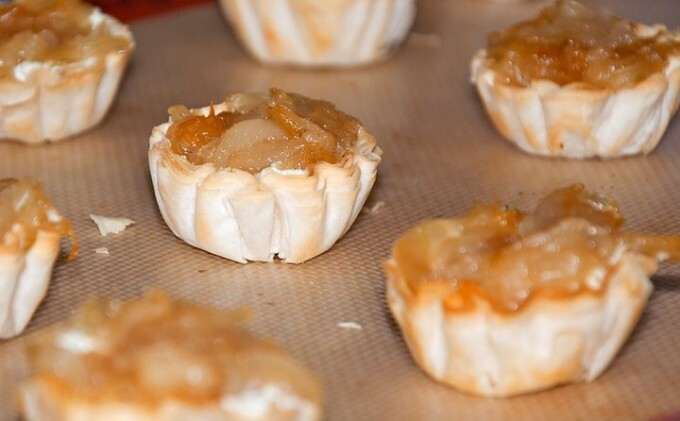 fill each cup with the goat cheese mixture and top with carmelized onions. Bake for 5 minutes and allow to cool for 1 minute before serving.